"The Last Cab-Driver" — Cruikshank's sixteenth illustration for "Sketches by Boz"
"The Last Cab-driver, and the First Omnibus Cad" — the seventeenth chapter in "Scenes," by Charles Dickens in Sketches by Boz, facing p. 104. Of all the cabriolet-drivers whom we have ever had the honour and gratification of knowing by sight​— and our acquaintance in this way has been most extensive — there is one who made an impression on our mind which can never be effaced, and who awakened in our bosom a feeling of admiration and respect, which we entertain a fatal presentiment will never be called forth again by any human being. He was a man of most simple and prepossessing appearance. He was a brown-whiskered, white-hatted, no-coated cabman; his nose was generally red, and his bright blue eye not unfrequently stood out in bold relief against a black border of artificial workmanship; his boots were of the Wellington form, pulled up to meet his corduroy knee-smalls, or at least to approach as near them as their dimensions would admit of; and his neck was usually garnished with a bright yellow handkerchief. In summer he carried in his mouth a flower; in winter, a straw​—​slight, but, to a contemplative mind, certain indications of a love of nature, and a taste for botany. — "Scenes," Chapter 17, "The Last Cab-driver, and the First Omnibus Cad," p. 104. Between 1833 and 1836 Dickens's journalistic studies or "sketches" of London life seized the public's imagination, and one of the first in what would prove Sketches by Boz, Illustrative of Every-day Life and Every-Day People (1836, 1839) was "The Last Cab-driver, and the First Omnibus Cad," which first appeared in the periodical Bell's Life in London on 29 November 1835 as "Scenes and Characters No. 6. Some Account of an Omnibus Cad," a conductor named William Barker. However, Cruikshank's chief interest here is the other urban transportation facilitator, the quirky cabriolet driver whose peculiar temper results in his incarceration in the solitary confinement cell at the Coldbath Fields Prison. However, despite the cabman's haunted stare, Cruikshank does not foreshadow the climax and dénouement of the anecdote, which Dickens actually expanded after its initial publication for the two-volume "Second Series" (December 1836). The first half of the "sketch" amounts to a character study of an unusual person, Cockney a cab-driver fed up with taking the verbal abuse and threats of his parsimonious fares. In his truculence he reminds one of Herman Melville's passive-aggressive Bartleby the Scrivener — with perhaps a dash of the cavalier unconcern for the passenger's sensibilities that one detects in the Bob Newhart sketch about the inconsiderate busdriver. The Cruikshank illustration situates the driver in his distinctive red cab on Old Bailey Street in the middle of a mixed residential and manufacturing district, as suggested by the embedded signage for Cigar divan, Real H. Blaguard, and Snuff Manufactory. These contextual elements disappear in the 1876 Household Edition illustration "I may as well get board, lodgin', and washin' till then, out of the country, as pay for it myself; consequently, here goes. ", replaced by a crowd of curious onlookers (including a young chimney-sweep who will appear in one of the forthcoming chapters, "The First of May") as the cab-driver hears out (and prepares to thrash) the disgruntled customer. The wide-eyed, haunted stare of Cruikshank's cabbie on the page opposite the start of the sketch prepares the reader for his somewhat excessive response to his customer's complaint. Cruikshank has deviated from Dickens's description of the cabman in that he apparently has no whiskers in the plate, but in other respects he appears exactly as described in the opening paragraph, except, of course, for the colours which Dickens specifies, yellow neckerchief and bright red cab, blue eyes and red nose, rendering him a doubly "colourful character" in a bland cityscape. Mr. Barker had not officiated for many months in this capacity, when the appearance of the first omnibus caused the public mind to go in a new direction, and prevented a great many hackney-coaches from going in any direction at all. The genius of Mr. Barker at once perceived the whole extent of the injury that would be eventually inflicted on cab and coach stands, and, by consequence, on watermen also, by the progress of the system of which the first omnibus was a part. He saw, too, the necessity of adopting some more profitable profession; and his active mind at once perceived how much might be done in the way of enticing the youthful and unwary, and shoving the old and helpless, into the wrong buss, and carrying them off, until, reduced to despair, they ransomed themselves by the payment of sixpence a-head, or, to adopt his own figurative expression in all its native beauty, "till they was rig'larly done over, and forked out the stumpy." An opportunity for realising his fondest anticipations, soon presented itself. Rumours were rife on the hackney-coach stands, that a buss was building, to run from Lisson​Grove to the Bank, down Oxford​Street and Holborn; and the rapid increase of busses on the Paddington​Road, encouraged the idea. Mr. Barker secretly and cautiously inquired in the proper quarters. The report was correct; the "Royal William"​was to make its first journey on the following Monday [in 1829, we may presume]. It was a crack affair altogether. 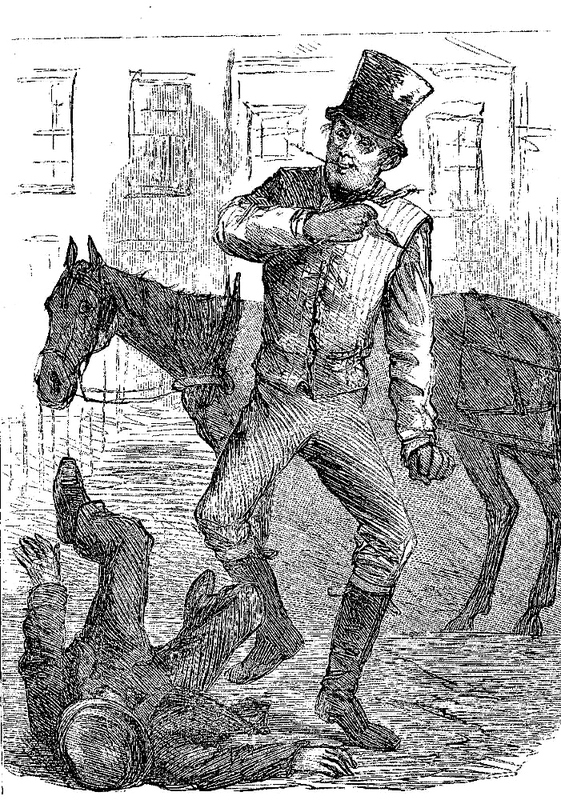 An enterprising young cabman, of established reputation as a dashing whip​— for he had compromised with the parents of three scrunched children, and just "worked out"​his fine for knocking down an old lady​— was the driver; and the spirited proprietor, knowing Mr. Barker's qualifications, appointed him to the vacant office of cad on the very first application. The buss began to run, and Mr. Barker entered into a new suit of clothes, and on a new sphere of action.— "Scenes," Chapter 17, "The Last Cab-driver, and the First Omnibus Cad," p. 109-110. 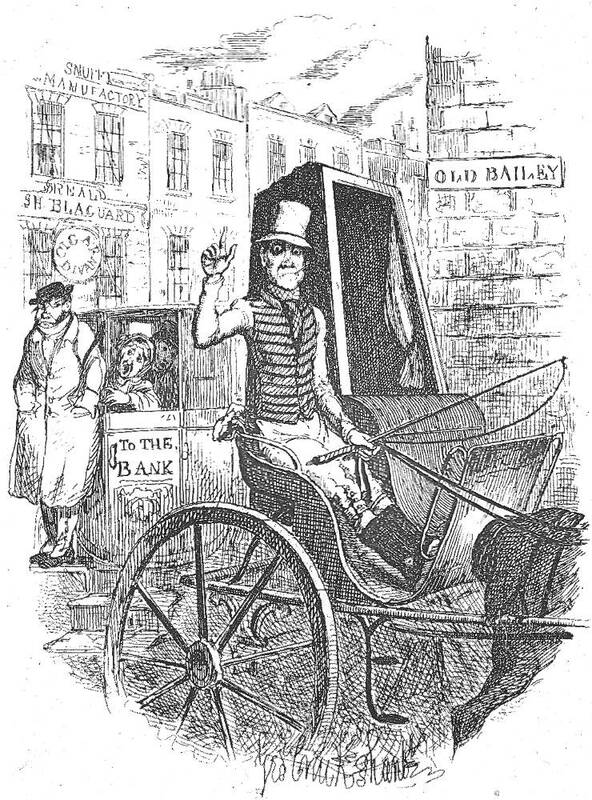 The cab itself is also worthy of comment since the passenger pod is adjacent to the driver rather than (as one might expect of a hansom cab) in front of him, precisely as in the roughly contemporaneous Robert Seymour illustration for the Pickwick Papers, The Pugnacious Cabman (Chapter 2, April 1836). Another interesting aspect of the composition is that the artist has worked his signature into the cross-hatching immediately beneath the cab, rather than situated the signature beneath the bottom vignetting, as in most of his illustrations. The hansom cabriolet (or "cab"), pulled by just a single horse, quickly replaced the hackney carriage because its driver could charge lower fares than two-horse vehicles. In 1834 by Joseph Hansom, a New York architect, patented the Hansom safety cab, which he actually developed and tested in Hinckley, Leicestershire. Its low centre of gravity enabled it to corner more rapidly, safely, and smoothly than the larger hackney. The red cabriolet that Dickens describes is, like most of its brethren, able to negotiate the congested urban streets with aplomb, as the adept driver has little difficulty in steering around larger vehicles and avoiding traffic jams, so that it was a vehicle exactly suited to the larger, more traffic-congested cities of Europe: Dublin, London, Paris, Berlin, and St. Petersburg. 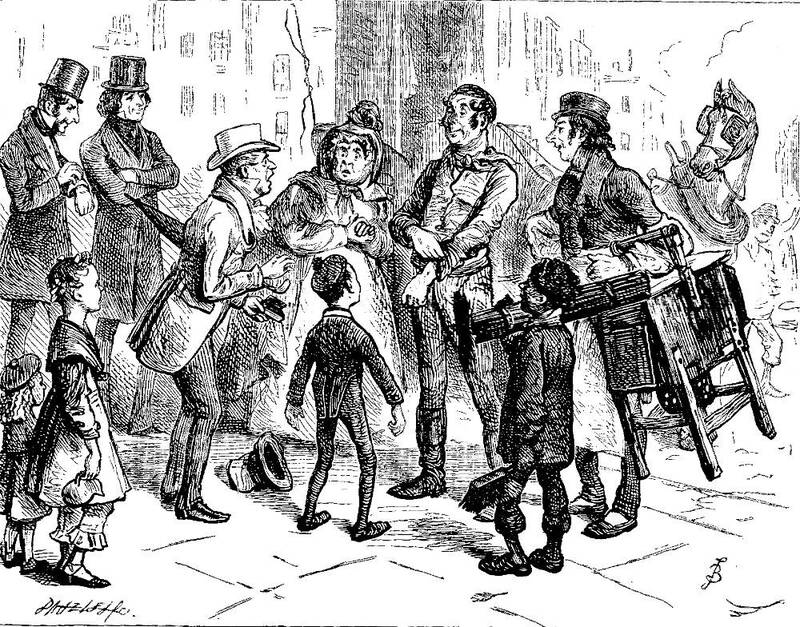 In the parallel Household Edition illustration of 1876, Fred Barnard shows an array of bystanders as the little passenger, umbrella under his arm, delivers his complaint about the fare as the cab-driver calmly rolls up his cuffs in preparation for the beating he is about to deliver before eight witnesses at Tottenham Court Road (the sidewalk and buildings sketched in lightly in linear perspective establish the urban setting). 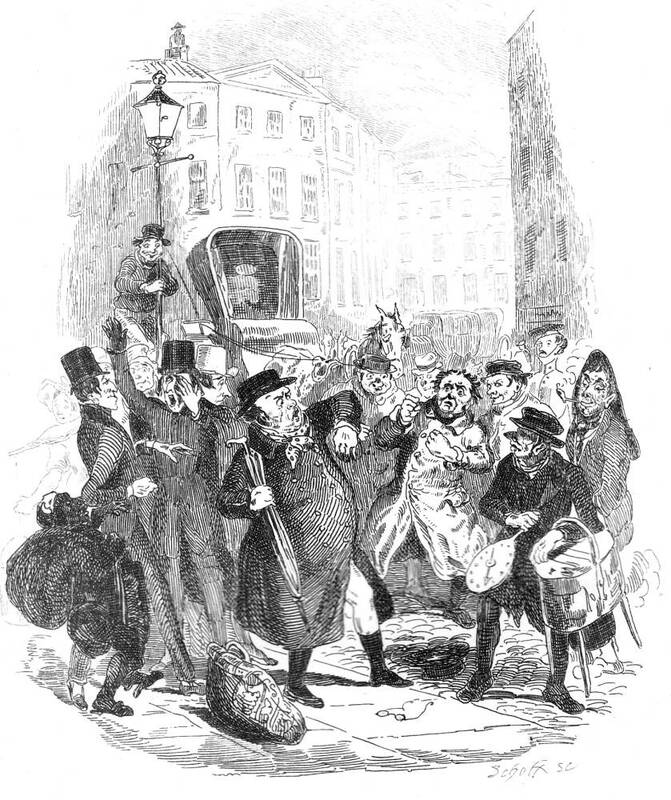 But in the original illustration by George Cruikshank, despite a realistic urban setting with house- and business-fronts and a street sign, the witnesses in the background are a Cruikshank interpolation as they come from the second half of the sketch. Indeed, Dickens does not allude to there being any witnesses, except, of course, the highly observant "Boz" himself. The illustrator's point of attack, as it were, is interesting in that it comes after the customer has complained and the cab-driver has commenced thrashing him.